The Story of Multi-Tasking Chaos To Peace. How many of you love to multi-task? I love it! It just seems like I am an octopus with 8 arms when I am able to have the washer, dryer, dishwasher and self-cleaning oven going all at the same time while I run the sweeper. But when the washer dings, the dryer buzzes and the hum of the dishwasher stops at the same time the timer goes off informing me the oven needs to quickly be wiped out from its “self-cleaning”, chaos sets in. I now need to hang the laundry in the washer, fold the laundry in the dryer before it wrinkles, unload the dishwasher to be prepared for meal #2 and get the crud off of the oven before it hardens again. What was I thinking? Now multi–tasking with 8 arms that sounded like such a good idea has now set into reality that I only have 2 hands and my peace is no longer calming!! The devil loves to create this in our lives. He loves to remind us about multi-tasking, especially when we are doing things for the Lord. For example, you sit down to have your morning devotions. Then in the quiet, you start worrying about something with your child. Then that drums up bitter feelings of what someone did to you 15 years ago at the church. Now your anger boils over to why that person who hurt you is successful and living the perfect life. And why don’t you get any breaks? Why is everything always happening to you? Now you’re mad; you’re worrying; you’re bitter and jealous! BAM – the devil has just rung his bell of multi-tasking chaos in your life and he is happy!! What did you sit down to do in the first place? Have a quiet time with the Lord. If we can stay focused on the Lord and give Him first place in our lives, He will take care of all of the multi-tasking that needs to be done. He is omnipotent and omnipresent. He knows it all and is everywhere. Talk about being able to multi-task in the right way! Exodus 14:14 says “The Lord will fight for you; you need only be still.” Let Him. Let Him fight for you. Let Him multi-task and take care of everything you think you need to worry about and control. You just focus on Him and do that one thing well and He will take care of the rest – including the nasty multi-tasking scum that lurks around from the darkness. Get out of my way devil. I’ve got to spent time with my God who will multi-task circles around you! Have a great day of focus and let God multi-task all the chaos into peace. 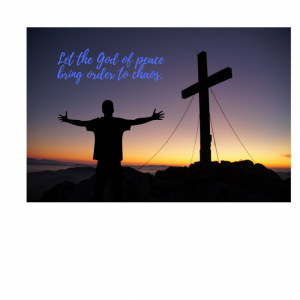 This entry was posted on September 14, 2017 with tags: #bestill, #Godofpeace, #makeadifferenceeveryday by Deanna Young.